For every big name horror author that you hear about—Dean Koontz, Stephen King, Clive Barker or Brian Keene—there is an extremely unsettling number of lesser known writers who deserve to be every bit as famous or well known for their work. And I get that. Music works the same way. We all know about Johnny Cash, but how many have ever heard the great Jerry Jeff Walker? I love it when I am not only impressed by someone I’ve never read before, but impressed to the point where I must track down and read all I can from them. Lee Thomas impressed me like that. I had the pleasure of reading Ash Street nearly two years ago, for review. I liked it. 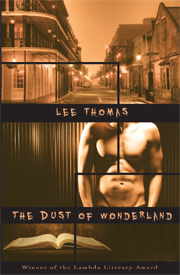 For some reason I forgot about Lee Thomas, until we connected online and discovered a mutual affinity for heavy metal. I got some more of his work and devoured them all—greedily. So the verdict would now be that he is amazing. You ought to be reading him. All of his work. 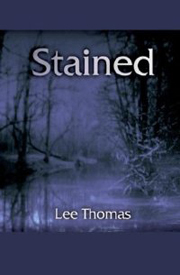 With his debut novel, Stained, Lee introduces us to what will become his recognizable style: strong, character driven with realistic attitudes towards the fucked up things that are going on. Said fucked up things in this novel include an almost viral evil that possesses its victims and then tweaks and perverts their deepest longings. Upon completion, I could barely believe this was a debut novel it was so strongly written. No wonder it won a Stoker! The original printing from Wildside Press is quite rare but worth tracking down. The Dust of Wonderland takes on a Southern Gothic sort of premise and punches it in its ghostly face. A man is called to New Orleans under tragic circumstances—his son lays in coma near death and the events that surround it all seem to tie to the frayed psyche of Ken Nicholson, a man who has built his unstable life on a shaking pile of secrets and stones. Things take strange turns and all fingers point to a man long dead. This book ups things a notch. The pacing is superb and the realistic characters and reactions are wonderful. Had Lee been putting these novels out in the early 80’s instead of this millennium, he’d be a paperback bestseller and mentioned in the same frantic fanboy breaths as Straub and King. After that, I read his superb novel The German. I thought the others were good…this was fantastic! Gripping from page one and it does not let up until the last sentence. Reading like a shadowy memoir of sorts, it tells the sad tale of a small Texas town plagued by strange murders and the mysterious German who seems to be the one they want to be responsible. Straddling the barbed wire fence between To Kill a Mockingbird and The Stranger, The German is a gritty affair but reads smooth and generates a well of emotion and outrage. Simply put, it is one of the finest novels I have read. 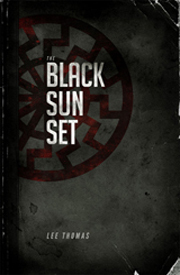 His chapbook The Black Sun Set, from Burning Effigy Press, is a nifty cocktail; one part noir and two parts metaphysical horror. A chilling post card of sorts. His collection Like Light for Flies shows us what Thomas is capable of in a shorter word count. The stories are eclectic and smart, some copping an early Barker vibe and a few holding a severely classic voice. You’ll read about a man and his dog and how they try to save the world from monsters from another dimension. There is twisted noir with supernatural shades. Plenty of shocks and cringe-inducing images, all handled with deft precision. And there you have it, a sort of Lee Thomas burrito. A brief encapsulation of what I have read, save for Butcher’s Road, which I have not yet finished but will review upon completion. Be on the lookout for my interview with Lee very soon! Why? Because you want to pitch your stuff. And you won’t be able to sign up at the convention. You have to do so now. To secure your slot, email RJ Cavender at rjc@editorialdepartment.com with your top three pitch choices. In the subject of your email, please write Pitch Sessions – (Author’s Last Name). All authors will be signed up for two pitch sessions, available on a first come, first serve basis. Not sure what each publisher and agent are looking for? There’s a website where they straight up tell you. Read it. See if you have anything that fits. Then sign up, and don’t be nervous. There will be a dark-haired Shock Totem girl in stilettos who will be helping out. Taking you to your pitch session, letting you know when your time is almost up. Straightening your collar and letting you know if there’s lipstick on your teeth. Join me! It will be fun! But sign up ASAP. Slots are limited and they started filling up immediately. Earlier tonight, John Skipp won the Stoker for his epic of an anthology Demons: Encounters with the Devil and His Minions, Fallen Angels, and the Possessed, which Mercedes has an excellent story in. A well-deserved win for a great editor and a fantastic anthology. Congrats to all involved! Later this month, at this year’s Bram Stoker Awards™ banquet, to be held at the World Horror Convention in Utah, Mercedes and I do battle. To the death! Okay, maybe not to the death. And maybe it’s not so much a battle. 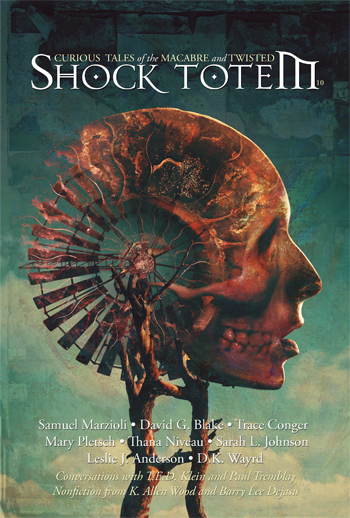 But we are both lucky enough to have stories included in an anthology up for a Stoker Award. That’s worthy of a battle roar or two! 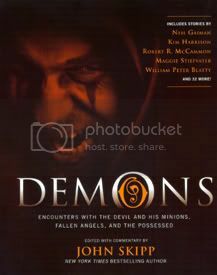 Demons: Encounters with the Devil and His Minions, Fallen Angels, and the Possessed, edited by John Skipp, features Mercedes’s short story “Daisies and Demons”; while my story, “A Deeper Kind of Cold,” appears in Epitaphs: The Journal of New England Horror Writers, edited by Tracy L. Carbone. Though some would call me biased, I think both anthologies are worthy of the nod. As I’m sure the other three anthologies up for the award are. So may the best one survi—win! May the best one win. In other news, John and I have had some very short pieces—by me, “Skipping Shingles”; by John, “Wishes” and “Always Never Enough”—published in Necon E-books’s just-released Best of 2011 flash fiction anthology. 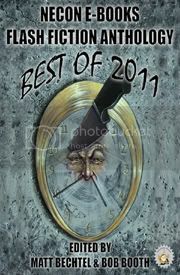 This e-book features all winning and honorable-mention entries from their monthly flash fiction contests throughout 2011, plus a few additional stories from the cover artist, Jill Bauman. I also hear he’s selling bridges in New York. If any of these books interest you, click on the cover images to purchase. 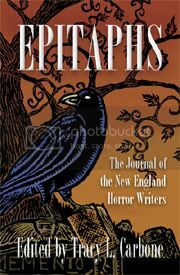 Three copies of Epitaphs: The Journal of New England Horror Writers, the Stoker Award nominated anthology featuring work from Kurt Newton, Rick Hautala, Christopher Golden, L.L. Soares, K. Allen Wood (that’s me! ), and twenty-one others, are being given away through Goodreads. If you’re interested in this fantastic collection, toss your name into the virtual hat by clicking Enter to Win below. 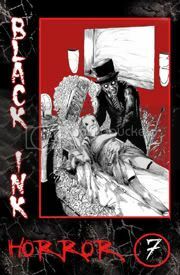 Giveaway ends March 19, 2012.